George Graham Reviews Duncan Sheik's "White Limousine"
Some of us who delight in music off the beaten path can fall into the trap of looking down one's noses at any artists who might have achieved some measure of commercial success. And much of the time, there is a degree of validity to that. The commercial media is such that an artist almost has to throw away one's sense of innovation and eclecticism to have any hope of getting on the commercial airwaves. But there have been those who use sales success as a way of attempting lead to one's fans into new musical territory. Paul Simon has long been known for that, as has Peter Gabriel. This week we have the latest recording by an artist who has had some measure of pop stardom, but over the past several years has moved into some very interesting creative pursuits, with uniformly fine results. Duncan Sheik's new release is called White Limousine, and it is an interesting hybrid of his more pop-oriented music with the his more atmospheric, contemplative side. It's also a technologically innovative recording. More about that later. A native of New Jersey, Duncan Sheik grew up in South Carolina, and attended Brown University, where he formed a rock band with Lisa Loeb, who become known in her own right. In his formative years, Sheik found himself drawn to artists like Nick Drake, Leonard Cohen, Richard Thompson and the Smiths, who share a kind of ruminating quality to their music, and that undercurrent would eventually find its way into Sheik's music. But his pop side came to the fore on his debut album in 1996 which spawned a considerable and particularly long-lived hit called Barely Breathing. His music also found its way into the soundtracks of TV series. After the success of his first two albums, Sheik began a collaboration with playwright Steven Sater, who belonged to the same Buddhist group as Sheik. Sater wrote some elliptical poetic words, and Shiek, who previously had created all his own lyrics, set Sater's words to music, in a style unabashedly influenced by the late Nick Drake, including string arrangements much in the style of those on Drake's recordings. Sheik even named his CD Phantom Moon, after Drake's Pink Moon album. Sheik's record company had trouble dealing with such a recording, and ended up releasing it on what was their classical and folk music division. Phantom Moon was a subtle but fascinating and richly rewarding recording that was one of my top picks for 2001. Shiek followed that the next year with a more pop influenced recording called Daylight, that spawned a hit called On a High which is still finding its way into the background music systems of department stores who are trying to be hip. Nevertheless the influence of Phantom Moon was also heard in places on Daylight and the latter deftly straddled the fence between eclecticism and commercial potential. In the meantime, Sheik has continued his fairly wide-ranging musical explorations, with more music for the theater and films, including "Great Expectations" and "Transamerica," and he scored the New York Public Theater's Shakespeare in the Park production of "The Twelfth Night." Sheik made White Limousine after he was dropped as an artist from Atlantic Records, so he found it liberating, making an album without having to look over his shoulder as to what the marketing people might think. The CD ends up as a kind of a cross between Phantom Moon and Daylight. Sheik also brings in more social commentary than on his previous recordings. Over the past few years, he has been involved with humanitarian projects in Albania and Cuba, and played numerous benefit concerts for hurricane victims, as well as being part of the Concerts for Change series in 2004. Sheik says that love and war are underlying themes to this CD. On White Limousine he is joined by some of the people who have worked with him in the past, including guitarist Gerry Leonard. Also prominent is the string section who were a part of the Phantom Moon CD, the London Session Orchestra, with the pastel-like arrangements provided by Simon Hale, who provided similar services on Phantom Moon. Also appearing are bassist Jeff Allen and drummer Doug Yowell. 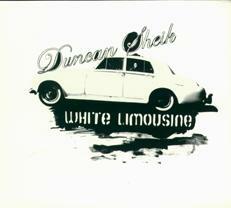 Duncan Shiek has created another fine album that combines thoughtful intelligent composing and lyric writing, and presents it in a creative mix of subtle sophisticated arrangements and orchestrations with enough pop elements to make White Limousine another potential hit for Sheik. Though with its release on a smaller record label, there is less chance of that happening. This album is also presented in a very innovative way. It comes on two discs, one labeled "mine" and the other "yours." The "mine" disc is a conventional CD with the music mixed by engineer Kevin Killen. The "yours" disc is a DVD-ROM which contains computer audio files of individual elements of each song, the vocals, the strings, the guitars, etc., along with a link to free software which one can use to mix the CD anyway one likes. This is the first time I have seen such a release. It allows the listener to be creative, but I think it will also provide an appreciation of how good a job Killen did with the mix. This concept, though it might not work for other artists, is a definite illustration to tech heads of advantage of physical recordings over downloads. The audio quality is very good, though as usual, the dynamic range could have been a bit better. Once again Duncan Sheik has proven to be a resourceful, creative artist who easily bridges the divide between popular music with potentially wide appeal and more eclectic, creative work.